The hunt for present or past life on Mars got a boost as NASA’s Curiosity rover records spikes in atmospheric methane ten times greater than previously measured by the unmanned probe. Though the levels are far below those found on Earth, methane is a key indicator that life may be or may once have been present. In addition, the nuclear-powered explorer has also detected the first confirmed organic compounds in drill samples taken from Martian rocks. NASA says that the methane was detected by the Sample Analysis at Mars (SAM) laboratory, which is one of the on-board experiments carried by Curiosity. Over a 20-month period, it took air samples and used its Tunable Laser Spectrometer to measure the amount of methane present. Until now, methane levels on the surface of Mars have been so small that early results indicated that it was non-existent, but low and variable levels have now been confirmed. According to the NASA, the levels jumped to seven parts per billion in late 2013 and early 2014, which is ten times the amount detected at other times of the year. NASA scientists say that the sharp up and down increases in methane indicate a local source, which may be biological or chemical in nature and may be due to some release from a below-ground source. NASA says that methane isn’t the only organic molecule Curiosity has found. Drill samples taken from an area called “Cumberland,” which was once mudstone comprising an ancient Martian lakebed, have yielded the first definite proof of the existence of organic chemicals on Mars. The organic molecules were detected beneath the surface in powdered rock brought up by the rover’s drill, where the sample was protected against the destructive radiation and volatile chemicals of the Martian surface. According to NASA, mudstone beds on Earth provide excellent conditions for collecting and preserving organic molecules. The samples were examined by setting the SAM into its Evolved Gas Analysis (EGA) mode, which heated the powder to 875⁰ C (around 1,600⁰ F). The gases given off were then passed through the Gas Chromatograph Mass Spectrometer (GCMS) and the constituents measured. The organics consist of several different organic compounds including chlorobenzene, dichloroethane, dichloropropane, dichlorobutane, and others. One interesting point is that chlorobenzene isn’t found naturally on Earth, though it’s used industrially in pesticides, herbicides, adhesives, paints, and rubber, while dichloropropane is found in paint strippers, varnishes, and furniture finish removers. As with the atmospheric methane, the source could be biological, but is more likely to be chemical. Either way, the compounds are probably of ancient origins, such as ancient hot springs interacting with rocks. NASA emphasizes that though Curiosity can detect organic molecules, it can’t determine if these are direct signs of ancient or present life. However, the new findings can provide new insights into the chemical processes at work on the Red Planet. Another problem is the highly reactive nature of the Martian soil due to millions of years of the surface being subjected to hard ultraviolet radiation in conditions drier than any found on Earth. Martian soil is loaded with perchlorates, which are chlorine-containing molecules that alter the structure of organic molecules and makes studying them that much harder. They also may be one reason for the presence of chlorine-containing molecules, such as chlorobenzene, in the samples. 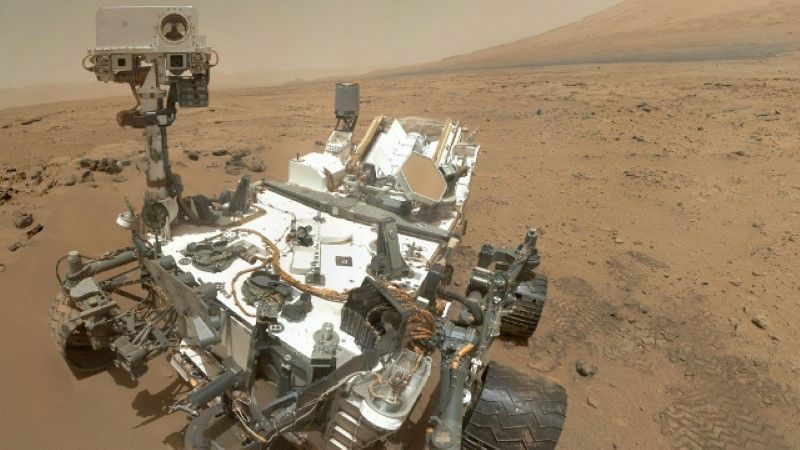 The Curiosity methane results were published in Science . In the video below, Daniel Glavin of NASA’s Goddard Space Flight Center discusses the discovery of organic matter on Mars.